This landslide occurred just south of Bendum. 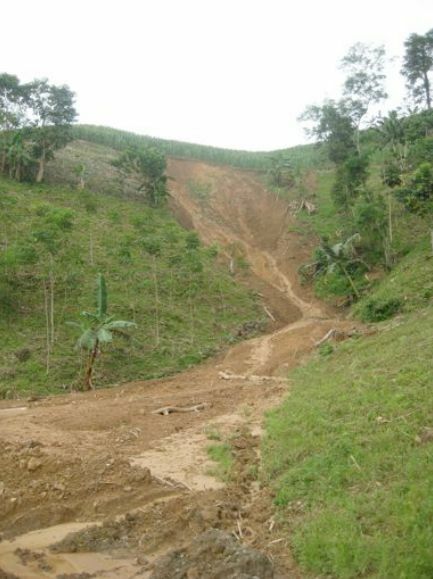 Over 50 landslides of this nature caused blockage along the roads and a loss of 20% or more in agricultural production. This form of slumpage is widespread in upland Mindanao where the forests have been cut for maize production. Bendum, though suffering similar rainfall events, does not show such scars on the landscape. This in part is a justification in its right to receive ecological service payments for good environmental management. These relational dynamics are part of the discussion with our partners from AdDU. Ateneo de Davao University (AdDU), a Filipino Jesuit university in Davao City, Mindanao, furthers its partnership with APC this summer by holding an exploratory visit in Bendum with 17 of its faculty and staff. The visit had a multifaceted objective, looking at various areas of possible collaborative engagement in areas of culture-based education, renewable energy, hydrological instrumentation for watershed modeling, geomatics applications, and migration. Some of these convergence areas are under the Belgian CUD-funded EPaM (Establishing Strategic Partnerships in Research to Strengthen Local Governance in Land and Water Management towards Greater Human Security in Mindanao) Project of which AdDU is an active local partner university. The opportunity to visit Bendum allowed the AdDU community to explore other areas of work where there can be meaningful collaboration such as culture-based education and school management through the establishment of a distance-learning program for BS Education for teachers in APC. The Engineering contingent of the group expressed interest in the newly established renewable energy system in Bendum, focusing on sustainability measures, which is a great need for many community-scale hydroelectric installations in Mindanao. ESSC will be installing a network of telemetric weather and stream gauging stations in the Upper Pulangi Watershed and it is getting from the AdDU College of Engineering the need instrumentation, which has a working prototype installed in the Davao River Basin. Finally, the AdDU Migration Center also sent its own participants who were able to identify further areas of research, looking at monitoring the whereabouts of children who had graduated from the APC since its early beginnings, as well as tracing movements of upland indigenous family groups in the Pantaron Range from where the Pulangi begins. There are also other emerging engagements with current Belgian partners in the field of migration where the Center can be engaged.